Straddling the narrow Kamchatka Isthmus in the Russian Far East, Koryaksky Zapovednik protects boreal, arctic, and coastal communities of northern Kamchatka. Here in the Koryakia Highlands, bighorn sheep climb rocky mountains while salmon ascend rivers in lush valleys below. Bears feast on the abundance of fish in the warm season, hibernating under the deep snow in winter. Two coastal areas of the nature reserve on the Bering Sea – Goven Peninsula and Lavrova Bay – host scores of colonies for cliff-dwelling birds during the nesting season. Larga seals and sea lions lounge on the rocks below. The rich wetlands of Parapolsky Dale have one of the highest levels of bird diversity in northeastern Asia. Morning skies cast a pink glow over Goven Peninsula. This bear snatched a fish heading upstream from the sea. The Bering Sea reflects the mountains of Goven Peninsula. A willow ptarmigan is well camouflaged in the tundra. Fall colors cloak a riverbank in the reserve. The long-tailed ground-squirrel is a prominent resident. Cliffs along the Bering Sea support bird rookeries. A red fox scavenges for food washed from the sea. Of the 35 mammals found in the harsh northern environment of Koryaksky Zapovednik, 24 are permanent inhabitants, five occur here occasionally, and six are marine mammals. Fauna in the reserve consists generally of northern boreal species, but lacks many true forest species. Tundra species are poorly represented. Brown bears (Ursus arctos) are ubiquitous – found from the seacoast to the subalpine belt – and number more than 100 on the Goven Peninsula alone. In summer, bears stick to thickets and river and lake shores, where they lay prominent trails. In winter, they hibernate mostly in dwarf pine thickets, with a number of concealed niches and deep snow cover. Polar bears (Ursus maritimus) occasionally wander into the reserve, generally debarking from ice floes that have been carried from the icy waters of the northern Bering Sea. Red foxes (Vulpes vulpes) prefer coastal and low mountain areas. Foxes are numerous, particularly on the western coast of the Goven Peninsula, but the population fluctuates depending on the abundance of fish, mice, and pine nuts. Wolves (Canis lupus) are rarely seen here, though the predators used to be quite common in the Koryakia Highlands before nearly being exterminated by hunters in the mid-20th century. Polar foxes (Alopex lagopus) stray into the reserve during their migrations from the northeastern part of the Koryakia Highlands. Wolverines (Gulo gulo) are found throughout the zapovednik, though they roam far and wide and are nowhere numerous. Among small carnivores, ermine (Mustela erminea) scampers through all types of terrain except the bare mountain tops. Weasels (M. nivalis) and otters (Lutra lutra) are present but not numerous. The only ungulates in the reserve are moose (Alces alces) – found here at the northern tip of its range, and the bighorn sheep (Ovis nivicola koriakorum) – an endemic local subspecies. The Koryakia Highlands host one of the largest populations of bighorn sheep in northeastern Asia. Bighorn sheep prefer mountain tops and alpine tundra habitats. The population on Goven Peninsula numbers approximately 70 animals. Other groups of bighorn sheep are found in the spurs of the Vetveysky and Penzhinsky ranges near the border of the Paraposky Dale section of the zapovednik. Moose are found only in the Parapolsky Dale section of the reserve in the Kuyul and Wineivayam river valleys. Mountain hare (Lepus timidus) and northern pika (Ochotona hyperborea) are common in the reserve, with hares found in a broad range of habitats from the seacoast to alpine areas, while the pika is found mostly in rocky alpine areas. Eleven species of rodents make up a vital part of the diets of predators and birds. The collard lemming (Dicrostonyx torquatos), which occurs here only sporadically, is the only representative of tundra faunal communities in the reserve. The long-tailed ground squirrel (Citellus undulatus) is one of the more noticeable rodents in the reserve – with 20-40 dens found on a single hectare in suitable habitats. The waters around Goven Peninsula harbor six species of marine mammals. The most common and permanent resident of the area is the larga seal (Phoca vitulina). As many as 200 seals gather at once on the exposed reefs at low tide near Cape Galinvilan. Other seal rookeries are located in Korfa Bay outside the reserve or on its border. The capes of Goven Peninsula also host some of the largest – while not permanent – rookeries for sea lions (Eumetopias jubatus) on Kamchatka, with populations in spring and summer from 300 to 2,500 animals. Walruses (Odobaenus rosmarus) feed in Korfa Bay and along areas of the Goven Peninsula coast. A permanent rookery on Cape Galinvilan hosts as many as 1,000 animals. Sea otters (Enhydra lutris) also frequent the waters of Korfa Bay and can be seen in the coastal waters of the zapovednik. Over 150 species of birds have been identified in Koryaksky Zapovednik, including about 100 nesting species and 25 migratory birds. The Parapolsky Dale section of the zapovednik has one of the richest levels of bird diversity in all of northeastern Asia. Bird species found here are typical of moss-tundra communities. Common species include Lapland bunting (Calcarius lapponicus), willow grouse (Lagopus lagopus), whimbrel (Numenius phaeopus), and bean goose (Anser fabalis), among others. Greater scaup (Aythya marila) and long-tailed duck (Clangula hyemalis) make up nearly half the population of nesting birds in this part of the zapovednik. Northern pintail (Anas acuta) and Eurasian widgeon (A. Penelope) are also present in large numbers. Fourteen kinds of waders nest in the Parapolsky Dale wetlands, the most common of which are the wood sandpiper (Tringa glareola) and the dunlin (Calidris alpina). Boreal species such as northern three-toed woodpecker (Picoides tridactylus), lesser spotted woodpecker (Dendrocopos medius), scarlet rosefinch (Carpodacus erythrinus), and white-tailed sea-eagle (Haliaëetus albicilla) are found in the forested valleys of Parapolsky Dale. Birds found in the mountainous habitat of Goven Peninsula are generally coastal cliff-dwelling species. More than 30 significant bird colonies line the shores of Goven Peninsula. The bird bazaars are made up largely of pelagic cormorant (Phalacrocorax pelagicus), slaty-backed gull (Larus schistisagus), kittiwake (Rissa trydactyla), pigeon guillemot (Cepphus columba), tufted puffin (Lunda cirrhata), and horned puffin (Fratercula corniculata). There are no reptiles on Kamchatka and the only amphibian in the reserve is the Siberian salamander (Salamandrella keyserlingii), which is found only sporadically. At least 20 species of fish inhabit the rivers of the zapovednik, but the most prevalent are pike perch (Esox lucius) and cisco (Coregonus spp.). Salmon ascend rivers in the zapovednik, including calico salmon (Oncorhynchus keta), humpback salmon (O. gorbuscha), and others. The Kamchatka Peninsula is a near island of floristic diversity, bordered by the bare tundra to the north. The arctic and northern boreal ecosystems of the reserve include 700 species of higher plants. Plants from the sedge family form the majority of the groundcover. Willows are the most prominent of the woody plant species. Endemic plants for northern Asia include Victor’s bitter-cress (Cardamine victoris), bleeding heart (Dicentra peregrina), pursh (Sieversia pusilla), and cudweed sagewort (Artemisia glomerata). Plant cover in Koryaksky Zapovednik is typical for forest and tundra ecosystems of the Bering Sea region. Plants are clearly distributed according to vertical zoning – sedge-cotton grass (Carex-Eriophorum) tundra communities and mixed forests extend along river valleys, while dwarf shrubs dominate the subalpine belt, and tundra covers the high mountains. Bands of forests extend along river valleys in the Parapolsky Dale section of the zapovednik. The primary species here are aromatic poplar (Populus suaveolens) and chosenia (Chosenia arbutifolia). Trees reach 25-30 meters in height, and diameter at chest height can reach 150 cm in poplars and 92 cm in chozenia. Shrubs include alder (Alnus incana), several species of willows (Salix spp. ), as well as red currant (Ribes rubrum) and honeysuckle (Lonicera caerulea). On drier ground brier rose (Rosa amblyotis, R. acicularis) and Alaska spirea (Spiraea beauverdiana) take root. Dense thickets of willow and alder reaching several meters high grow in the middle and upper reaches of river valleys. As the mountains rise above the river terraces, vegetation typical of the subalpine belt begins to predominate. Here dwarf pine (Pinus pumila) and shrub alder (Alnus fruticosa) reach up the slopes. Mountain tops are covered with alpine vegetation – mainly alpine tundra, rockslides, and bare cliffs. Alpine meadows are found in moist areas, generally where the snow melts last. The lower extent of the alpine belt on the Goven Peninsula begins at about 150-300 meters above sea level, while in the mountains near Parapolsky Dale alpine vegetation doesn’t reach below 600-700 meters. Alpine tundra ecosystems for the most part consist of lichen and thicket plant communities with mountain avens (Dryas octopetala), saxifrages (Saxifraga spp. ), rhododendron (Rhododendron aureum, Rh. camtschaticum), locoweed (Oxytropis spp. ), bearberry (Arctostaphylos arctica), and other shrubs and grasses. Moss-sedge communities are found in some areas, as well as graminoid-sedge and forb plant associations. The highest peaks are occupied by rocky areas bare of vegetation. Wetlands occupy half of the zapovednik, and the Parapolsky Dale section of the reserve is made up entirely of marsh and lake ecosystems. Arctic pendant grass (Arctophila fulva) and horsetail (Equisetum spp.) grow along lake shores and in shallow water. Northern groundsel (Senecio tundricola) is found on clay soils in exposed lakebeds. Sedge grasses and graminoids such as woodreed (Calamagrostis spp.) and meadowgrass (Poa spp.) grow in thin strips along lake edges. Koryaksky Zapovednik is situated in the Koryakia Autonomous Province in the northern part of the Russian Far East. 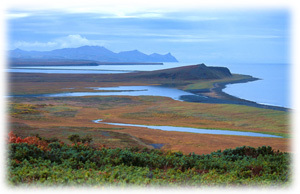 The reserve straddles the isthmus of the Kamchatka Peninsula and includes coastal and marine areas of the Bering Sea. The zapovednik is located on three different territories: Parapolsky Dol (Dale) (176,422 ha) in the Penzhinsky District; and Goven Peninsula (128,224 ha) and Lavrova Bay (22,510 ha) in the Olyutorsky District. The Parapolsky Dale section protects inland habitats in the western part of the isthmus. The Lavrova Bay and Goven Peninsula sections include 83,000 ha of marine habitat on the eastern side of the Kamchatka Peninsula in the Bering Sea. Buffer zones limiting the regime of nature use have been established around the sections, with the buffer zone around Parapolsky Dale covering 337,467 ha and that of the Goven Peninsula and neighboring Lavrova Bay covering 338,595 ha. There are many lakes and rivers in Koryaksky Zapovednik. Lakes in the mountains are relatively deep with rocky bottoms and crystal clear water. Lakes in river valleys are shallower with silt bottoms and rich plant life. The harsh arctic climate in the Koryakia Highlands is characterized by long, cold winters (average temperatures in January drop to -25oC) and short cool summers (average July temperatures reach only 11oC). Precipitation levels amount to 300 to 700 mm a year. Permafrost covers the entire territory of the reserve. Koryaksy Zapovednik was established on December 26, 1995 to protect the northern boreal and arctic communities of the Kamchatka Isthmus and on the Bering Sea coast. Part of the Parapolsky Dale section (176,422 ha) of the reserve was granted status of a wetland of international importance under the Ramsar Convention for its role in providing habitat for large numbers of waterfowl. Plant and animal communities in the reserve are relatively stable, except perhaps along the few roads. Grazing of domestic reindeer does impact some meadow communities, but it can be seen as an inalienable part of local natural ecosystems. Poaching of fish and wildlife in the reserve is sometimes an issue, but given its remote location, it rarely reaches dangerous levels. One of the greatest problems facing the zapovednik today is the difficulty of recruiting professionals to staff the science and ranger departments, due to the reserve’s remote location and difficult living conditions. Text prepared by Laura Williams, based on materials provided by Koryaksky Zapovednik.